If you have a love of outdoor adventure and nature, then apply for the National Geographic Adventure internship. There are several internships available in different aspects of the photography experience: Art and Production, Editorial Research, Online Research, and Photo Research. Each internship interest needs to be addressed to a different department head. All internships must be working towards college credits and are unpaid. Send general inquiries to: adventure@ngs.org. Editorial Research Internship: Attn Andrea Minarcek. This is an interesting program that actually designs an internship for you for a fee. Because you pay for the organization of the experience, the programs are open to all including college students, graduates and professionals. Film and photography internships are available among others where the company, Connect 1-2-3, arranges accommodations, professional internship with local business, assists with transport, meets you at the airport and more. The internships do not pay but can be tailored to your exact specifications. Worth a look at if you need something specific. Looking to work on your wedding photo skills? Consider an internship with Hoffer Photography! They are actively looking for interns for their 2011 wedding season. You will assist with lighting, organizing, traveling to shoots, and even doing a few sets. They require a few interns who are fun, hard-working, have a driver's license and are self-motivated. If you live in the downtown PA area and can make a season-long commitment, send an email to info@hofferphotography.com with 'intern' as the subject. Make sure to include your name, your phone number, a résumé or background, a portfolio (if you have one), a photo of yourself, and why you want to be an intern. Internship for this company is not necessarily for those majoring in photography but is for those who ask the best questions and need college credit. Interns are expected to work hard and be on time but not expected to be skilled in lighting systems or techniques. Students need to make a three-month commitment to the internship and the profession while being willing to do mundane tasks. Check out their site for more information then send an email to edward@carreonphotography.com. Remember to ask good questions and show initiative. Few can claim the legendary status of nature photographer Ansel Adams, a conservationist who also helped pioneer many of the scientific photo techniques still employed today. Adams lived an eventful life from 1902-1984; in 1906 he survived the great San Francisco earthquake but was thrown face-first into a brick garden wall, gaining his famous broken nose. Grandson of a wealthy land and timber baron, Adams nonetheless was taught to respect and cherish the natural world lending to his chosen subject matter of mountains, bodies of water and woods. He is most noted for his breathtaking captures of Yosemite National Park, the southwest and the west in general. Along with Fred Archer, Adams helped developed the 'Zone System' between 1939 and 1940. This technique ascertained film exposure and development optimization, defining the precise connection between the final product and the artist's vision. With a basis in the black and white, it nevertheless spilled over to all rolled film, reversal and negative and even the digital genre. 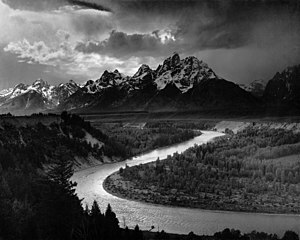 It became Adams' signature look along with some specific darkroom techniques, offering a lustrous texture using tones and is still imitated today. Adams continues to influence generations with his powerful images composed of the majestic beauty of nature. His techniques and methods vaulted photography to entirely new areas both artistically and scientifically. Some may recall he was also well known for his activism in environmental conservation and women's suffrage. Adams remains a fascinating character and deserving of the respect he has garnered in this field. Adams is rightfully credited as the father of artistic expression and emotion in photography, elevating the form to be on par with the depth of music and painting. He is quoted as saying, "It is easy to take a photograph, but it is harder to make a masterpiece in photography than in any other art medium." The medium has gained immense acceptance since the days of Adams as a legitimate artistic format but owes much of this to Ansel, his pioneering attitude and his ground breaking methods. Even fashion photography has become high art thanks to Adams' efforts and belief in the beauty of the photograph.